Wilkie, a Pentagon official, is Trump's third pick for the job in 18 months. 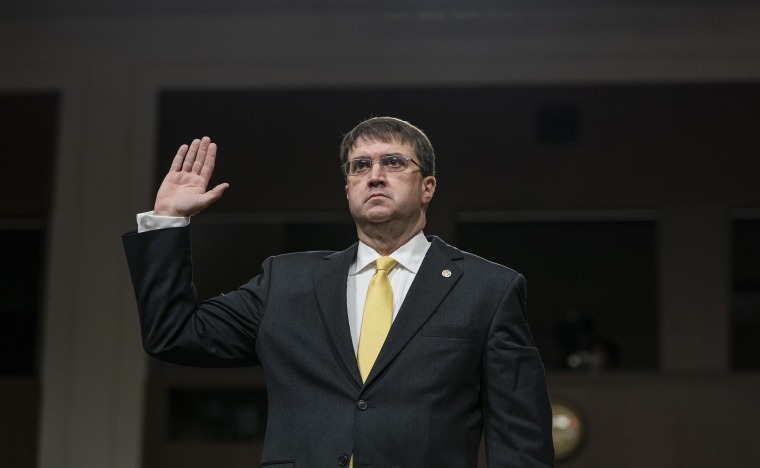 WASHINGTON — The Senate confirmed Pentagon official Robert Wilkie as secretary of Veterans Affairs Monday, officially tasking him with fulfilling President Donald Trump's promises to fire bad VA employees and steer more patients to the private sector. He was expected to easily win confirmation after a Senate panel approved his nomination earlier this month. Only Sen. Bernie Sanders of Vermont at the time voted "no," citing concerns the Trump administration would "privatize" VA.
"I applaud the United States Senate for confirming Robert Wilkie as the Secretary of Veterans Affairs. Mr. Wilkie has dedicated his life to serving his country with honor and pride," Trump said in a statement after the Senate vote. Wilkie, 55, is expected to be sworn into office quickly, the White House has told some veterans groups, possibly joining Trump at the Veterans of Foreign Wars national convention Tuesday in Kansas City. VFW has left a slot open for the "VA secretary" to speak before Trump addresses the convention. "I have been privileged to work for some of the most high-powered people in this town," said Wilkie, who was a Pentagon undersecretary for Defense Secretary Jim Mattis. "They pay me for their opinions, and I give those to them." In his new role, Wilkie is charged with carrying out a newly signed law by Trump to ease access to private health providers. That law gives the VA secretary wide authority to decide when veterans can bypass the VA, based on whether they receive "quality" care. Major veterans' groups see VA medical centers as best-suited to veterans' specialized needs, such as treatment for post-traumatic stress. Wilkie also has more power under a new accountability law to fire VA employees. Lawmakers from both parties have recently raised questions about the law's implementation, including how whistleblower complaints are handled and whether the law is being disproportionately used against rank-and-file employees rather than senior managers who set policy. He replaces current acting VA secretary Peter O'Rourke. Since taking over the acting role in late May, O'Rourke has clashed with the VA inspector general, initially refusing to release documents relating to VA whistleblower complaints and casting the independent watchdog as an underling who must "act accordingly." Under pressure from Congress, the VA agreed last week to provide documents to the IG.